MV Giamani was built in 1998 to IMO standards. She was copletly refurbished in 2014 and the guest numbers are limited to only 10 people on each trip to ensure that there is always plenty of space for all guests onboard. She has 1 Master cabin and four Deluxe cabins. The Master Cabins is situated on the upper deck behind the wheel house and hase a double bed and its own private Bathroom. On the main deck you find four Deluxe cabins with two single berths. Each deluxe cabin has it own air conditioning unit, en suite bathroom and the cabin door opens to spectacular sea views. Enjoy the air conditioned saloon for watching a movie, playing back your digital images from that day’s dives, or browse through our extensive library of marine books. The popular cushion relax area in the rear part of the upper deck gives you plenty of space to read a book, enjoy the views and chat about the thrilling dives of that day. The dive deck is spacious with camera tables and rinse tanks making this an ideal boat for serious photographers. On the main deck all meals are served buffet style, the food is plentiful and diverse, Thai cuisine and International dishes are served, special diets can be catered for if we know in advance. An ice making machine ensures you can enjoy chilled drinks while watching the sun set and a freezer onboard means ice cream can be enjoyed after a hot day in Tropical Thailand, Myanmar or Indonesia. 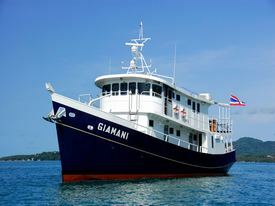 MV Giamani has a full complement of safety equipment making her a spacious, safe and diver friendly boat.